The holiday season is upon us. One of the things I like best about this time of year is getting to spend time with my family (parents and sibling). I live a thousand miles away from them but we get together at both Thanksgiving and Christmas and it’s a special time for us to keep our bonds strong. I also love the trappings of the season, the decorations and festive lights, and I love getting cards from friends who I often only hear from once a year. And of course I love the books! I always get books in some form for Christmas, although in the past few years I’m more likely to get a gift card for my Kindle than paperbacks. This year I’m hoping for a copy of The Penguin Book of Witches, some LCHF (low carb high fat) cookbooks, and The Essential Lenormand along with a gorgeous new deck, the Gilded Reverie Lenormand by Ciro Marchetti. With my Kindle gift card, I plan to pick up some new PNR and UF books, including the next Kresley Cole book, Shadow’s Claim (“next” for me! ), Diana Gabaldon’s Dragonfly in Amber, Kelley Armstrong’s Waking the Witch, Ilona Andrews’ Burn for Me (if I don’t buy it sooner! ), Keri Arthur’s Dangerous Games, and maybe one of Anne Bishop’s books. I also wanted to give you a look at this excerpt from Her Vampire Mate, available now for pre-order and “live” starting December 2. Many thanks to theherdhops.blogspot.com for hosting this hop! Antonio left his hand on the werewolf’s neck, massaging her with his fingers. She might be everything he didn’t look for in a woman but he felt an overwhelming urge to find out more about her. For a moment, he felt her relax into him. Her head fell back just the slightest inch. Then she jerked away and headed for the outside door. She sucked in her breath and walked even faster. Antonio knew what he wanted to do and it didn’t have anything to do with finding a world-walker. Jennalynn couldn’t believe the fates had been so cruel as to mate her to a vampire. What was she supposed to do with him? They were enemies. She couldn’t very well live with him. And yet she’d go mad if he wasn’t in her life. Literally. Mated werewolves who lost their mates went mad. If they were old enough, their bodies gave out and they died. If they were young, they usually killed themselves. So those were her choices. Try to find a way to be mates with a vampire or die. A vampire and a werewolf. Enemies. Mates. Searching for the same world-walker, vampire and professional poisoner Antonio de Marco feels drawn to his werewolf foe. He loves women, always has, so he rolls with it. Maybe seducing her will throw her off her game. Thrown together repeatedly, they finally team up to track down the world-walker, never realizing the danger waiting for them if they succeed in finding her. This 30,000+ word long book is the fourth in the Colliding Worlds series. HEA included. This title was also published in the Crave anthology. 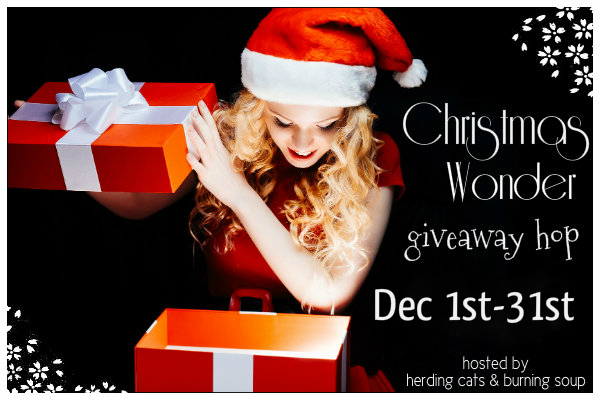 Hi Tabitha, I’m commenting to enter the Wish List of Books: Christmas Wonder #Giveaway Hop. Happy Holidays, Blessings & Thanks to All. Just a helpful note, usually when you ask someone to add a book to their Goodreads shelf, there is a link right there in the Rafflecopter to send them straight to the book page on Goodreads. Thanks for the giveaway and have a great holiday season! I entered my email in the boxes above the comment box! Thank you for the excerpt it was good! Have a great Holiday. Thank you for sharing the excerpt and for the giveaway! With the Amazon gift card I could buy a book or two for myself without feeling guilty getting something for myself this time of year. Thank you for the chance to win it! Thank you so much for the amazing giveaway(s)! More important than the giveaway, I hope that you have a very Merry Christmas this year! I love Christmas and spending time with family, but I don’t really like the season of winter much, too cold. Thanks for the giveaway. Happy Holidays! Thanks for the giveaway. Looking forward to reading Vampire Mate during the holidays. Thanks for the giveaway; this books sounds great! Thanks for being a part of this FAB blog hop! I can’t wait to read Her Vampire Mate. Thanks for the great giveaway. Happy Holidays!